It took me longer to finish reading this one, because there were a lot more comics that I wasn't all that impressed with. There's a particular obsession with Origami Cyclone this time around, and I can only read the same version of his "sad, in the background loner" story so many times before getting bored. There's also a bit too much of Blue Rose pining over Wild Tiger. Some of it's cute and funny, but a lot of it's just the same thing rehashed too often.I wasn't as impressed by the color plates this time around; it's disappointing, since that was one of my favorite parts of the first volume. And a couple of the comics crossed from "eh, bored" to "ACTIVELY DO NOT APPRECIATE THIS," which is always a danger in an anthology. There are too many voices for all of them to be of equal quality.The good comics in the anthology are still wonderful, though. Some bright points included:* "Good Luck Charm" - Barnaby realizing how much he's come to rely on Kotetsu and how much he misses him when he's not around)* "Good Luck Daddy" - Barnaby helping Kotetsu figure out how to impress his daughter, and Kaede appreciating the effort he goes to, even if it doesn't turn out all that great * "Hopeless" - Barnaby complaining about Kotetsu's messy habits but refusing to let anyone else help him clean up after him* "Please Help Me" - Fire Emblem finally gets a solid depiction that shows his humor but also his kind, insightful, advice-giving side; telling Origami to stop trying to imitate others and "polish yourself until you shine" was spot on* "Cooking from the Heart" - I'm going to be happy with any version of Barnaby learning how to cook Kotetsu fried rice; this version was particularly delightful, with a sweet and funny twistI was going to list more, but this is getting long. Apparently I actually did enjoy more of this volume than I'd remembered. Good thing I take notes as I read!There were also three stories set in Kotetsu's hometown, which I LOVED. Two included Barnaby meeting Kotetsu's family - aka the thing I want most out of the upcoming new season. 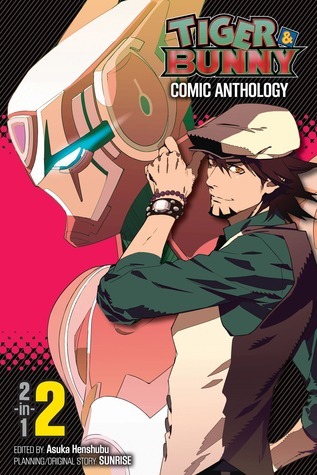 The third - by Tomo, my favorite artist from Volume 1 - was centered around Kotetsu and his daughter and was simply wonderful. Beautiful art and a funny, yet emotionally powerful story that feels true to the show's writing.And like Tomo said in their author's note at the end, I'm sad to reach the end of these! I've run out of official books in this series, for now, since the rest haven't been translated from Japanese. Perhaps there will be updated editions accompanying the new season so I can continue spending time with all these heroes. I didn't even realize Viz was releasing these anthologies. They're essentially doujinshi stories of what happened to the heroes of Stern Bild City during and after the anime series. I like the ones with Kaede and Blue Rose, but some of the art and stories are fairly uneven. And by uneven, I actually mean not very good. If you're a fan of the series, give it a try. If you're not a fan, give these anthologies a pass. This was my first introduction to the series, and though it makes a lot of references to the main story, it does make me want to read more of it.